The first and highly personal perspective into the work and processes of Ann Demeulemeester, introduced by Patti Smith. 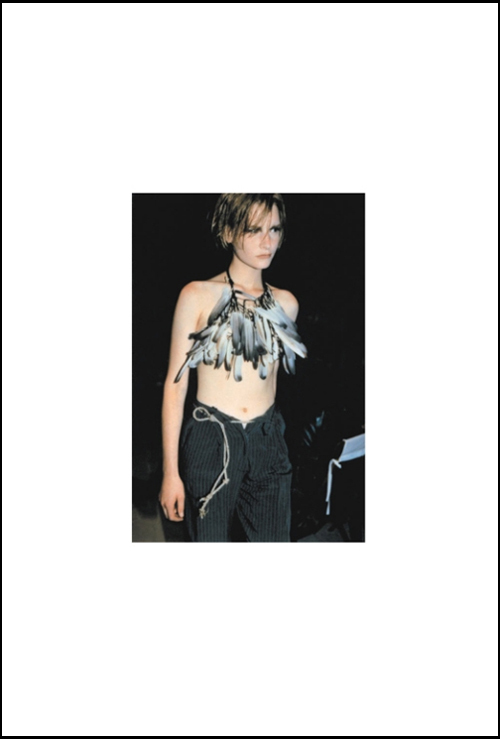 Graduating from Antwerp’s Royal Academy of Fine Arts in 1981, Ann Demeulemeester (and her contemporaries in the Antwerp Six) transformed global fashion with an aggressive restatement of traditional fashion design and a polemical approach to luxury trends. She founded her label in 1985 and imbues her designs with a strong narrative and rebellious spirit. For Demeulemeester, fashion is a form of communication. Her complex language of contrasts covers a whole gamut of emotions. The tension is highly poetic, and her clothes reveal many layers of soul. Known for her elegant tailoring and dark yet glamorous aesthetic, she created a serene and darkly romantic world with an intriguing mix of edgy rebellion and sophistication. photo right: Ann Demeulemeester Spring / Summer 1992 collection, model Kristen Owen.